Safety evaluation is a critical part of drug and cosmetic development. In recent years there is a growing understanding that animal experiments fail to predict the human response, necessitating the development of alternative models to predict drug toxicity. The recent tightening of European regulations preventing the cosmetic industry from using animals in research and development, blocks companies like L’Oréal and Estée Lauder from developing new products, bringing massive investment into this field. The main challenge in replacing animal experiments is that human cells seldom survive more than a few days outside the body. 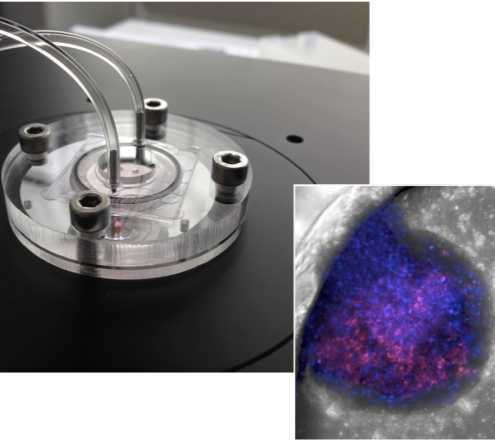 To address this challenge, scientists at the Hebrew University of Jerusalem and the Fraunhofer Institute for Cell Therapy and Immunology in Germany partnered to create a liver-on-chip device mimicking human physiology. “The liver organs we created were less than a millimeter in diameter and survive for more than a month,” said Prof. Yaakov Nahmias, the study’s lead author and Director of the Alexander Grass Center for Bioengineering at the Hebrew University. While other groups showed similar results, the breakthrough came when the groups added nanotechnology-based sensors to the mix. “We realized that because we are building the organs ourselves, we are not limited to biology, and could introduce electronic and optical sensors to the tissue itself. Essentially we are building bionic organs on a chip,” said Nahmias. The addition of nanotechnology-based optoelectronic sensors to the living tissues enabled the group to identify a new mechanism of acetaminophen (Tylenol) toxicity. “Because we placed sensors inside the tissue, we could detect small and fast changes in cellular respiration that nobody else could,” said Nahmias. The authors discovered that acetaminophen blocked respiration, much faster and at a much lower dose than previously believed. The current understanding was that acetaminophen was broken to a toxic compound, called NAPQI, before damaging the cells. As the liver could naturally deactivate NAPQI, damage was thought to occur only at high doses and in cases of diseased or compromised liver function. The current study, released online in the leading journal Archives of Toxicology, turns 50 years of research on its head. The authors found that acetaminophen itself can stop cellular respiration in minutes, even in the absence of NAPQI, explaining much of the off target effects of the drugs. The results mark the first discovery of a new toxicity mechanism using the newly emerging human-on-a-chip technology, suggesting that the development of alternative models for animal testing is just around the corner. The global market of this technology is estimated to grow to $17 billion by 2018, showing a double-digit annual growth rate in the last three years. August 17, 2015 - 'Bionic Organs-on-a-Chip' to End Animal Testing Arutz ShevaIsraeli-German joint research on liver-on-chip with nanotechnology may spell end of animal experiments - it already disproves Tylenol myths. September 19, 2018 - 7 amazing body parts that can now be 3D printed MD LinxScientists are using 3D printing to create bioengineered body parts such as eyes, ears, teeth, hearts, skin, bone, and even ovaries. August 14, 2018 - ARTIFICIAL HUMAN: Austrian laboratory 3D-prints placenta in BIZARRE experiment Express.co.ukAN AUSTRIAN laboratory has successfully pushed the boundaries of modern medicine by creating an artificial human placenta from 3D printing materials. November 20, 2018 - 9 Pieces of Bionic Tech That Will Make You Superhuman Interesting EngineeringCheck out these bionic technologies that equip people to do more and give a glimpse of our superhuman future.